Dallas Cowboys rookie corner back Jourdan Lewis has been found not guilty of misdemeanor domestic violence charges, according to reports. 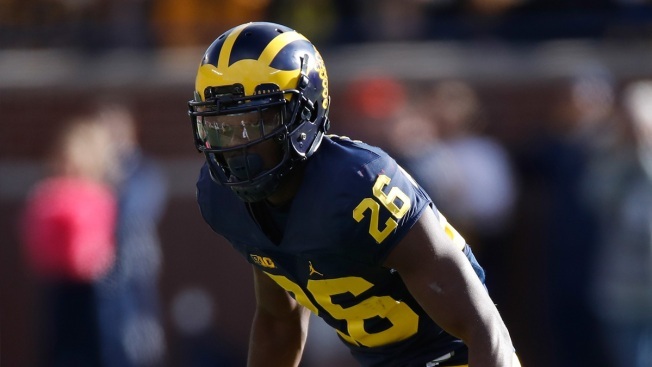 The third-round pick out of Michigan was accused of assaulting his girlfriend in Ann Arbor earlier this year. Police responded to call on March 15 at the shared-residence of Lewis and the girlfriend, where she alleged he attacked. Lewis has claimed his innocence, telling reporters he was trying to leave the home and she would not allow him to. Lewis, 21, didn't testify, but the jury saw a video recording of a police interview in which he said he was asleep when the woman woke him to complain about finances, and he hit her with a pillow. The woman testified he struck her in the face so hard she was forced into a wall. Two Ann Arbor police officers said they didn't see any injuries on the woman and she refused medical attention. The rookie is now expected to join the team in Oxnard, California, for training camp. He joins camp amid a bevy of character questions surrounding the Cowboys' organization. Jerry Jones and company just cut Lucky Whitehead, who was falsely accused of shoplifting; the team is awaiting word from the league on whether or not star running back Ezekiel Elliot will be suspended; and the team has other players who are already beginning the season on suspension. Lewis' acquittal is certainly a small amount of good news for the team, but the Cowboys have much larger issues they must face before the season starts. Things are definitely not going as well as one would hope after the team's most successful season in almost a decade.